The Smiling Assassin a Quitter? When one of New Zealand’s greatest character actors John Phillip Key quit his role as prime minister on December 5, the ex-London & Wall Street banker claimed he wanted to spend more time with family. It is now so commonplace for elites and super-rich oligarchs to claim they are resigning or selling part of their empire to ‘spend more time with family’, it really should be regarded by ‘We, the Tax Cattle’ for what it really means: a beacon for elites to pay attention to the circumstances. Indeed, Key’s resignation was reported around the world. Mr Nice Guy’s Voice Breaks: Key’s insiders never reckoned on their dirty attack politics being found out. Key’s December 5 resignation was a shock to most because he was still getting his kicks out of pretending to be a prime minister like any functional psychopath who enjoys keeping the public in the dark about the trajectory the country is really on. And like any other skilled narcissist, he was still loving the attention even as he met US Secretary of State John Kerry on Sunday November 13, while Greenpeace chased the world’s largest seismic testing ship, the Amazon Warrior, as it headed down the East Coast of the imaginatively renamed North Island in a truck towing large inflatable craft. All of this occurred the day before a magnitude 7.8 earthquake hit Kaikoura, a coastal town on the east coast of the imaginatively re-named South Island that was opposed to deep sea oil drilling in whale-majestic waters and who were soon graced with the presence of the first US naval ship in over thirty years offering assistance. So Key’s breaking voice, while he was delivering the breaking news, is perhaps a ‘tell’ that something snapped, in the wake of such exquisite poetry. When forced into a corner, the Smiling Assassin has in his own words, “taken the knife to some other people and now I’m taking it to myself”. The former global derivatives and bond trader earned the nickname the ‘Smiling Assassin’ because he had smiled while he fired hundreds of staff at Merrill Lynch’s London office, when financial trades started to unravel that the bank blamed the Russian debt default of August 1998, a repercussion of the Asian financial contagion. ‘Nice Guy’ Key made several other statements at his Resignation Ritual that made his departure seem like it was just a personal decision – that he wanted to rewrite the rule-book on leadership departures. 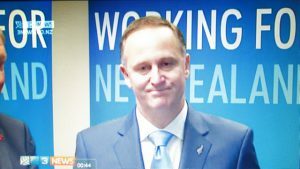 Key’s justification to ‘Rewrite the Political Departures Rulebook’ references ‘political capital’, suggesting that his long-running constructed popularity is in decline and that if plotted on a chart, it would be spent in attempting to win a fourth time, or perhaps during a fourth term. Several years back the Smiling Assassin said he would have to be dragged out of the Beehive. 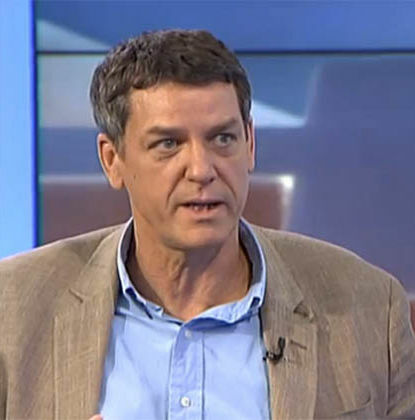 In July 2016, New Zealand born Rich-Lister Stephen Jennings made a whistle-stop tour to Aotearoa, wherein he warned that New Zealand risked Trump/Brexit type reactions if serious issues to do with inequality were not sufficiently addressed. In other words, Jennings was saying the discontent for the super-rich is growing and people are voting against the economic super-blocs, such as the European Union and the Trans-Pacific Partnership, that are favoured by the wealthy. In short, Jennings may have been signaling that Key would be gone-burger because the political puppet acting as a prime minister had aligned himself too visibly with the superstructure for regional super-blocs that most people now detest. Twenty years prior, Jennings privately sponsored a secret group of six people to study the political landscape of New Zealand across every electorate in order to predict the likely outcome of the first MMP election. Jennings, who accumulated most of his $980million in wealth in Russia after the Wall Street-City of London engineered break-up of the Soviet Union, traveled with his secret political analysis team to Germany. There the Secret Seven formulated questions for Jennings to ask a member of the German Green Party, who was in an adjoining room behind one-way glass. But, unlike the children’s mystery adventure series The Secret Seven by Enid Blyton, there was no hearing any, “Buried treasure blah, blah, blah…” for six of the Secret Seven. That’s because six of the secret group could only see Jennings talk and then listen to the German Green Party member’s answers from the adjoining room. After each exchange, Jennings would rejoin the group with the opinion of the German familiar with the political habitat of Mixed Member Proportional election systems, a voting system where each voter gets two votes, one for the party and one for the member of a seat. Rich-Lister’s Warning: Inequality will bite the rich if it’s not addressed, said Jennings. TVNZ’s Q+A July 2016. Incredibly, Jennings’ secret group predicted accurately who would form the governments of New Zealand for seven elections, from 1996 to 2014. The group did not always get the margins or the reasons for victory correct. But still, the work by Jennings secret group was surely worth more to New Zealand’s Rich-Lister Civil Oligarchy than flying blind with unsophisticated political polls. My hunch is that Jennings’ was tapped by New Zealand’s Civil Oligarchy to conduct a new study to figure out what party or coalition of parties would win power in 2017. 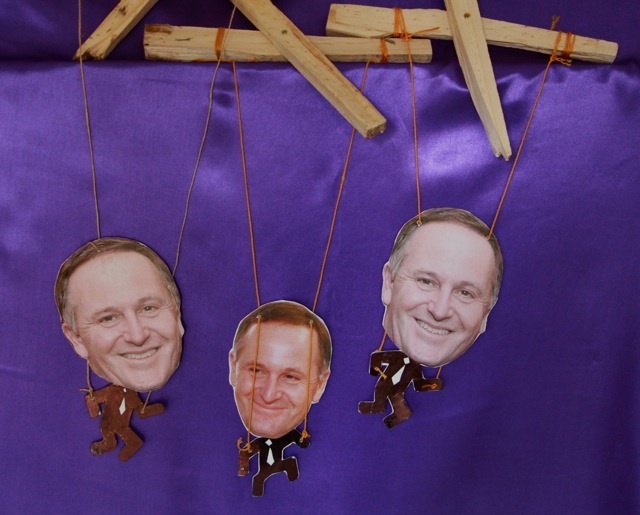 It may be that Jennings found out that it was highly improbable that Key and National would re-win power if he stayed on as leader, despite what the current polls say. Jennings activities are those consistent with an oligarchic wealth defense. As an oligarch, he is an unusual one because he appears to have developed a conscience, which is rare among this minority social group. Oligarchs are super-rich people who use their enormous economic wealth to steer the trajectory of whole societies, particularly when they act as a cohesive coalition, or an oligarchy. Oligarchs are dangerous because they can only exist is societies with vast material inequality and, in fact, they thrive in crisis-ridden societies. Although Jennings was warning that the problems of inequality would come back to bite the wealthy unless they reduced the hardship, he was careful to avoid pointing his finger of blame at New Zealand’s Civil Oligarchy and their counterparts throughout the Neo-Colonial Empire. That is because Jennings’ loyalty is to the New Zealand Rich-Lister Civil Oligarchy. He received mentoring from corporate raider Ron Brierley before he was re-assigned by Credit Suisse First Boston in 1992 to go set up an investment bank in Russia to exploit the break-up of the vast industrial monopolies. The capacity of ‘Mr. Nice Guy’ to fend off calls for independent inquiries into various crises, scandals and intrigues – child poverty, housing, homelessness, the great state-housing sell-off, structural unemployment, Mount National Debt, Dirty Politics, GCSB spying, the Kim Dotcom extradition affair, finance company bailouts, the Trans-Pacific Partnership regional state superstructure, Child Abuse, Prominent Persons with Name Suppression, serial Pony-tail pulling, the Christchurch Rebuild, and the suspicious Israelis during the Christchurch earthquake – have all relied on the savvy hyper-individualism that pervades Nu Zillun’s star-struck media who serially fail to successfully sustain serious investigations. Mr. Nice Guy’s pastel colored Political Cardigan began to fray immediately after the public voted against the flag change he had championed. The failure to change the national flag was a bigger political defeat than the star struck public media were willing to concede. 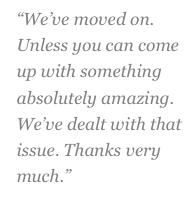 The flag change was meant to work as a mechanism of distraction all of the way through to the 2017 election by creating a copy of reality to hide the crises, scandals and intrigues that New Zealand’s most narcissistic serial-selfie poser did not like talking about. Imagine all the news stories a new flag would have generated in the Make-Real World – as new uniforms, official stationery, licenses and passports and flagpoles sported the proposed ‘Beach Towel’ design. You see an incessant PR-exercise-dressed-up-as-news, right? The new beach towel flag design would have cued surface-deep conversations for those caught under The Matador’s spell. Indeed, John Key had claimed a new flag could “build overt signs of patriotism”, as Radio New Zealand reported in August 2015. Indeed, the editor of The Daily Blog, Martyn ‘Bomber’ Bradbury, predicted on 25 March 2016 that the star-struck media would restart the distraction. Right on cue, immediately following the flag change defeat, The New Zealand Herald’s business media missionary Fran O’Sullivan ran a story “Key’s vision – Switzerland south”, which read like a carrot distraction piece from the Key Ministry’s media machine to perk up his base of ‘Know Nothing New Zealanders’. With subtly as scarce as cash in Nu Zillun’s debt-ridden ‘rock star economy’, Key’s vision signaled New Zealand was an ideal tax haven because the super-wealthy see the South Pacific Realm of the Anglo-Dutch-American-Swiss-Venetian-Israeli Neo-Colonial Empire as a bolt-hole to escape the converging crises of the Northern Hemisphere. 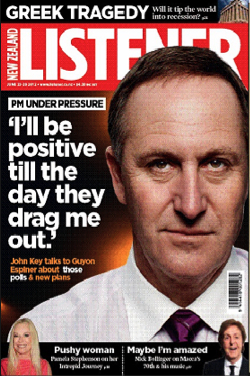 With poetic timing, Key’s vision to transform New Zealand into a Switzerland of the south crashed a few lunchtimes later when the Panama Papers tax evasion scandal hit the headlines around the world. Key’s denials that New Zealand was a tax-haven for foreign trusts showed Key did not care that wealthy foreigners use New Zealand to park wealth here to evade taxes, a finding supported by Professor Michael Littlewood of Auckland University. The Panama Papers scandal also showed that New Zealand’s media took the International Consortium of Investigative Journalists’ (ICIJ) investigation seriously enough that TVNZ’s One News and Radio New Zealand dug into the data dump, and did so collaborating with one of ICIJ’s members Nicky Hager, the journalist that Key had slandered throughout the Dirty Politics scandal of 2014. Furthermore, the Panama Papers scandal converged with New Zealand’s housing crisis, homelessness crisis and child poverty crisis. Together, these crises shouted that the New Zealand Tax Herd’s role is to build out the infrastructure for foreign-owned transnationals, who repatriate profits overseas with ease because they pay tiny taxes so small you need a microscope to see them, while too many live in structural poverty. These were the moments when New Zealand media’s enthrallment with John ‘The Matador’ Key was waning. The star-struck media showed they were finally responding to therapy served at them from the independent media and were recovering from a weird Zombie-viral mutation of Stockholm Syndrome, whose ultimate authors were political strategists, CrosbyITextor Group, and National Party campaign manager, Jo de Joux. Stockholm syndrome, or capture-bonding, is a psychological phenomenon first described in 1973 that occurs to people in a captive or hostage situation, who express empathy and sympathy and have positive feelings toward their captors, sometimes to the point of defending and identifying with the captors. Key, however, remained an at-large Zombie entity, proving he was more difficult to kill off than a current affairs show, especially as the ‘free market’ Zombie infection spread through the host population. 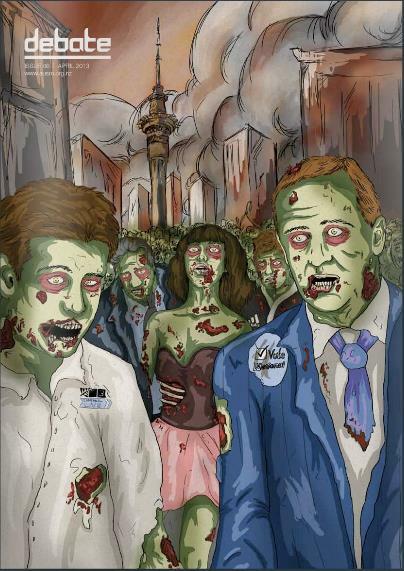 Apocalyptic Infection: During Key’s Ministry, a Neo-Liberal ‘free market’ Zombie contagion claimed many media victims. As a group of USA and Canadian American mathematical and computer science students found in their study of zombie outbreaks, “When zombies attack! Mathematical modeling of an outbreak of zombie infection”, the best way to kill off zombies is to hit them hard and often. Their key finding had practical application, they said, to apply to political party support. New Zealand’s media missionaries did not kill off Key-the-Zombie entity because they stubbornly refused to wake-up to the beatings they have been taking in their ratings, declining readerships and critiques in the emergent independent media. If New Zealand’s five major media cartel corporations – MediaWorks, Fairfax Media, APN/NZME, Sky TV, and TVNZ – were willing to insert 100% Pure Truth in news, with lead stories and feature pieces retracting the fake news that has been reproduced from the Colonial to the Neo-Colonial eras, they would have huge audiences. To sum up, the Smiling Assassin’s political capital was in steady decline and he knew it. In the months ahead, it is ‘who benefits’ from snatching the Smiling Assassin’s smile that may provide the clues to why exactly Key knifed himself. Munz, P., Hudea, I., Imad, J., & Smith, R. J. (2009). When zombies attack! Mathematical modeling of an outbreak of zombie infection. In J. M. Tchuenche & C. Chiyaka (Eds. ), Infectious disease modeling research progress (pp. 133-150). Hauppauge, NY: Nova Science Publishers.